taken in the late 1950s - photo courtesy of the Angle family. [right] With one of his Space Station models, taken 1999. XSL-01 and Space Station from Revell. by the space scientist and engineer Ellwyn E. Angle. Ellwyn Angle's connection with Revell came about by chance. As a young engineer he had worked on the Bell X-1 project alongside pilot Charles E. 'Chuck' Yeager , and later on other X-Planes projects up to the Bell X-5. In 1956 he joined a new company started in Sherman Oaks, California, SLC - Systems Laboratories Corporation. SLC had been created by Dr. John L. Barnes; Richard H. DeLano and Dr. James A. Marsh, as a company to study the 'preliminary design of basic studies for interplanetary travel'. By one of those coincidences, SLC's President, John Barnes, knew the head of PR at Revell, then located not that far away in Venice, California, and discussions took place about making a model of one of the company's advanced spacecraft designs. Revell was aiming to join the 'space age' anyway as founder, Lew Glazer, was very keen to promote space technology in his models. Consequently this must have helped clinch the deal. The work needed to develop the design was passed onto one of SLC's young engineers - Ellwyn E. Angle. He had done some preliminary sketches of a 'Lunar Probe Vehicle' - a liquid fuelled Moon launcher with clustered first stages and an atomic powered third stage - the Moonship. It was this design that was developed into the XSL-01, or 'eXperimental Space Laboratory, number 1'. Although the work came through SLC, it was short-lived company and before Ellwyn had completed it, the company had been taken over. He therefore did most of the later work at his home in Santa Monica. The XSL-01 sold well for Revell and the company asked Ellwyn Angle to design a second kit, this time for a space station but one that was NOT the archetypal wheel shape. The result was the slightly more prosaically named Space Station kit that was released in 1959. This used the modular approach now seen in the International Space Station, and before to a certain extent with Mir, with only some sections rotating. This was a completely different approach to the - then - almost universally-accepted wheel-shaped space station, examples of which had been made as kits by Strombecker and Lindberg. 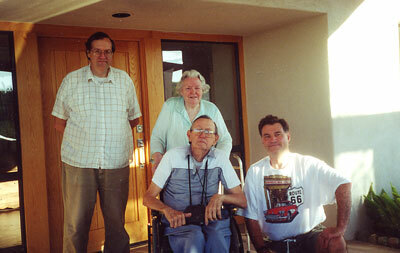 Ellwyn, his wife Marilyn and their son, Jonathan, moved from California to Tucson, Arizona, in 1996, prompted by the earthquake on the west coast in January 1994. His collection of XSL-01 and Space Station models had been damaged during the 'quake, but after the move Jonathan painstakingly repaired them and they were put back on display in the family home. The Angle display of the Revell models. There are two Space Stations and seven XSL-01s - one each for their children and grandchildren. Ellwyn Angle had unfortunately been injured in accident at the home in California and was confined to a wheelchair in his later years. However this not stop him leading a full life in his new home, being specially designed and single story throughout, and he always ensured that the bottles of wine were kept in reach on the lowest shelf in the kitchen! He was also intrigued that his designs, from what was almost half a century ago, were remembered and revered by the space modelling fraternity. Unfortunately Ellwyn and Marilyn lost their eldest daughter, Karen, who died in April 2002. Dr Karen Harvey was prominent astronomer, specialising in solar physics, and was married to award-winner astronomer, Dr John 'Jack' Harvey. She now has an asteroid named for her. Part of Karen's interest in astrophysics could have been put down to her father helping her with a project on 'the effects of solar wind pressure on the stability of spacecraft', linked to what he was doing for the Revell Space Station kit. Ellwyn Angle had gone into hospital for routine operation to replace a heart valve. 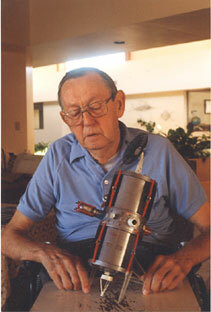 Forever the optimist he had even joked with his surgeon, "Even old cars need new valves!" Unfortunately he never recovered and died on 14th February 2003. He was 81 and would have been 82 at the end of March. 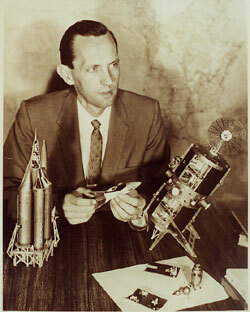 Intriguingly when Revell had wanted a space rocket back in the 1950s, it was for a craft "20 years into the future". This would have been the 1970s. However many of the concepts in the XSL-01 including the power for the Moonship - a fission reactor using liquid hydrogen - is still only now being investigated, so maybe Ellwyn E. Angle's designs were even further ahead? 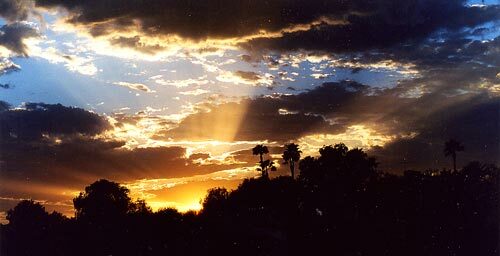 The skies of Arizona are invariably spectacular due the high altitude and clear atmosphere. This photo was taken from the roof of the Angle household; ironically on 10th September, 2001. Unfortunately the tooling for both the XSL-01 and the Space Station no longer exists, making a proposed reissue - initially planned with a new introduction by Ellwyn E. Angle - impossible. However Fantastic Plastic has issued a resin kit of the XSL-01, and separately, the Moonship, in the larger 1:72 scale, so Ellwyn's design lives on.